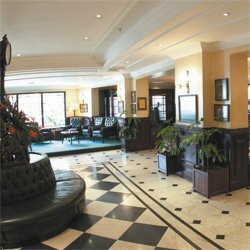 The Sarova Stanley Hotel Nairobi is a classic. The original Stanley hotel was the first hotel in Nairobi, opening it’s doors in 1902, but the current site has only been in use since 1912 and the current hotel is a new construction. It’s built very nicely in colonial style, with green leather lashings, chandeliers and old-fashioned fans in the public area. Guests of the Stanley have included Frank Sinatra, Winston Churchill and Ernest Hemingway. Author Karen Blixen (“Out of Africa”) frequently lunched here. The hotel is one of several Sarova hotels in Kenya, and is also part of the Summit family of hotels. All in all, it can certainly be recommended. There are 8 floors and 217 rooms at the Stanley, each one air conditioned and spacious. If you need more space than a standard room, there are several suites and even a penthouse that takes up the entire top floor. All rooms at the Stanley have free internet access, 24-hour room service, and an in-room safe and refrigerator (with mini-bar). Ask for a wake-up call so you aren't late for your next tour group. As for other amenities, you'll find a fully equipped gym and health club right in the hotel. The club is open throughout the day and can provide for any fitness need you might have. There is a full compliment of weight training machines and weights, as well as yoga, martial arts and aerobics classes. Too energetic for you? Relax with a facial, massage or just have a steam in the sauna. Tours to the many sights of Nairobi can be arranged through the hotel, including the Nairobi National Park game reserve that is right outside the city. There are 4 places where you can have a bite to eat or a drink, so you can choose what suits your mood. Especially the Zen restaurant (with international and fusion cuisine) has an excellent reputation, but the other facilities are highly regarded, too. The famous Thorn Tree café offers a casual spot for a cup of tea or coffee, along with some fine pastry. For a more elegant meal, visit the Thai Chi restaurant. The cuisine is authentic Thai, and so is the atmosphere. For an informal place to relax and have a drink or two, you should stop into the Exchange Bar. The Stanley Hotel Nairobi is right in the middle of all the Nairobi action, near the corner of Kenyatta Avenue and Kimathi Street. That's right in the business district and about a half hour drive from the Jomo Kenyatta International Airport. What Else is Near the Stanley Hotel Nairobi? As I mentioned, the Nairobi National Park is located just outside the city, and is a must-see if you're staying in Nairobi. Though there are far larger parks in Kenya, it’s a full wildlife resort and can’t be beat for convenience if you’re time pressured. You’ll be in the middle of the bush with many wild animals to be spotted. You're also not far from the National Museum, for when you want something a little quieter and more cultured. Lots of other tourist attractions around town are close to the Stanley Hotel Nairobi.